By now you have learnt that the salt formed by the combination of hydrochloric acid and sodium hydroxide solution is called sodium chloride. This is the salt that you use in food. You must have observed in the above Activity that it is a neutral salt. Seawater contains many salts dissolved in it. Sodium chloride is separated from these salts. Deposits of solid salt are also found in several parts of the world. These large crystals are often brown due to impurities. This is called rock salt. Beds of rock salt were formed when seas of bygone ages dried up. Rock salt is mined like coal. 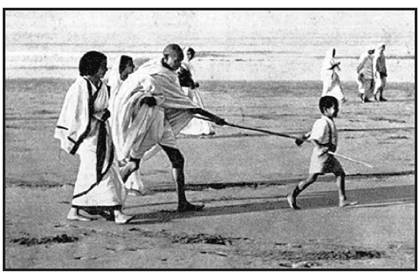 You must have heard about Mahatma Gandhi’s Dandi March. Did you know that sodium chloride was such an important symbol in our struggle for freedom? The common salt thus obtained is an important raw material for various materials of daily use, such as sodium hydroxide, baking soda, washing soda, bleaching powder and many more. Let us see how one substance is used for making all these different substances. When electricity is passed through an aqueous solution of sodium chloride (called brine), it decomposes to form sodium hydroxide. 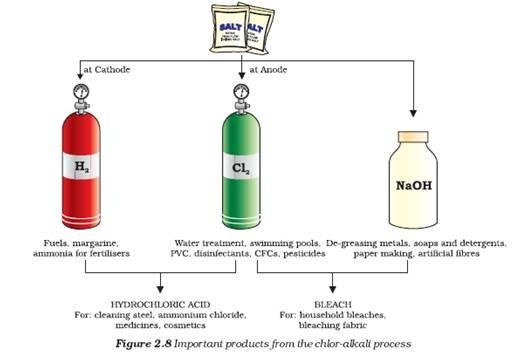 The process is called the chlor-alkali process because of the products formed– chlor for chlorine and alkali for sodium hydroxide. Chlorine gas is given off at the anode, and hydrogen gas at the cathode. Sodium hydroxide solution is formed near the cathode. The three products produced in this process are all useful. Figure 2.8 shows the different uses of these products. You have already come to know that chlorine is produced during the electrolysis of aqueous sodium chloride (brine). This chlorine gas is used for the manufacture of bleaching powder. Bleaching powder is produced by the action of chlorine on dry slaked lime [Ca(OH)2]. Bleaching powder is represented as CaOCl2, though the actual composition is quite complex. The soda commonly used in the kitchen for making tasty crispy pakoras is baking soda. Sometimes it is added for faster cooking. The chemical name of the compound is sodium hydrogencarbonate (NaHCO3). It is produced using sodium chloride as one of the raw materials. Sodium hydrogencarbonate has got various uses in the household. (ii) Sodium hydrogencarbonate is also an ingredient in antacids. Being alkaline, it neutralises excess acid in the stomach and provides relief. (iii) It is also used in soda-acid fire extinguishers. What does 10H2O signify? Does it make Na2CO3 wet? We will address this question in the next section. Sodium carbonate and sodium hydrogencarbonate are useful chemicals for many industrial processes as well. you have just copied everything from the NCERT text book huh….